"This is an old time recipe from a collection of recipes my mother was given when she got married. It's a creamier pie than a New York style and is quite nice in the mornings with coffee. Original recipe by Dorothy Harker." To Make Crust: In a small bowl, mix together crushed graham crackers and melted butter or margarine. Press mixture into bottom and sides of a 9 inch pie pan. To Make Filling: In a medium mixing bowl whip cream cheese until fluffy. Beat in 3/4 cup sugar, then add eggs, 2 teaspoons vanilla extract, and lemon juice. Mix until smooth. Pour into crust. Bake in preheated oven for 15 to 20 minutes, until set around edges. Remove and cool 5 minutes. 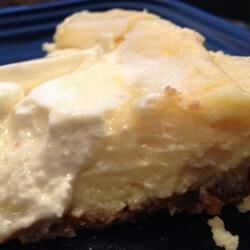 To Make Topping: Mix together sour cream, 3 1/2 tablespoons sugar, and 1 teaspoon vanilla. Spread over top of pie and return to oven for 10 minutes. Chill at least 5 hours before serving.